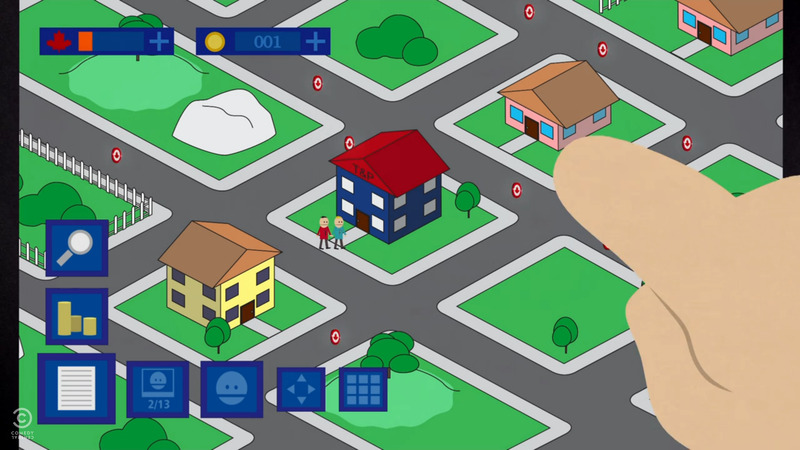 Comedy Central/South ParkWhy would I waste my time straining my eyes playing on this when I can be playing a game on the PS4, Xbox One, or Wii U? As someone who plays video game consoles somewhat regularly, I’ll occasionally get asked what I think of mobile games. I usually try to avoid answering, because if I’m perfectly honest, I’m not that fond of them. While I enjoy a limited few, I find most to be time-sucking procrastination machines that are hastily engineered ripoffs of games I played long ago on consoles and PC. The purpose of the majority of them appears to be to try to get me addicted and to shell out money for silly upgrades to keep me coming back for more. No thanks. I’ve never known how to articulate my feelings about mobile games out loud, though. Just about everyone I know seems to be hooked on some version of “Flappy Bird,” “Dots,” “Candy Crush,” or whatever new game is hot at the moment. So I was exhilarated when the latest episode of “South Park” Wednesday evening centered around the addictiveness of free mobile games and the thought process that goes into developing one. It basically summed up everything I feel about mobile gaming: the games are overly simple and repetitive, the gameplay itself isn’t long, players are pressured into making trivial purchases, and the games aren’t even that fun. 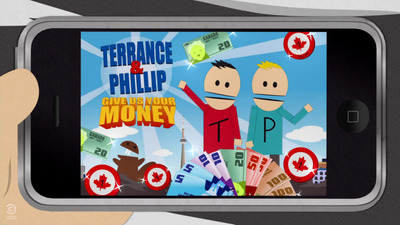 It all starts out when Kyle and a few of his friends are introduced to a new game based on their favourite Canadian cartoon characters Terrence and Phillip. 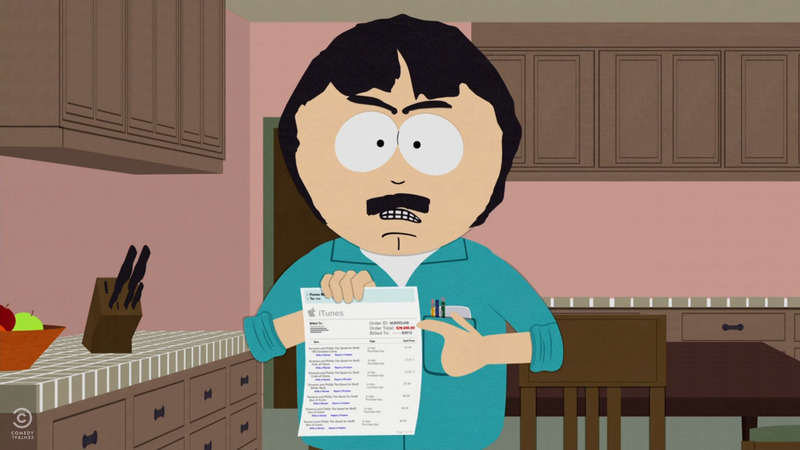 Comedy Central/South ParkNo Kyle! Don’t do it! They all hear about the mobile game from their school friend Jimmy who pressures them into downloading the free game because “If it’s free, why wouldn’t you?” Sounds promising. It looks like a generic clone of your run-of-the-mill free mobile game app. The goal of the game is ridiculously simple. 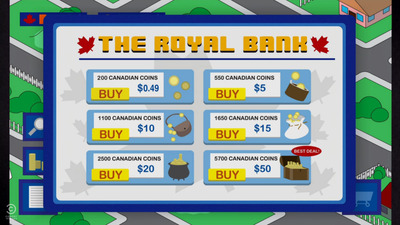 All players need to do is collect coins on a screen simply by tapping them. This shouldn’t be a toughy. 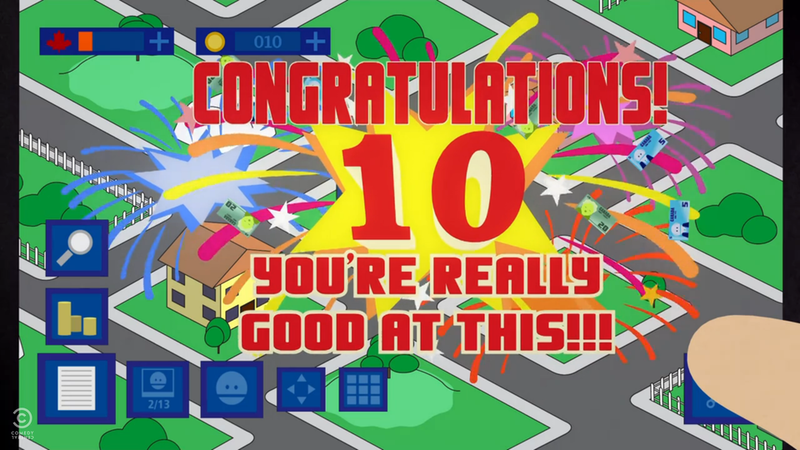 After he collects 10 coins, he’s given a small reward on screen telling him how well he did and encouraging him to keep playing. 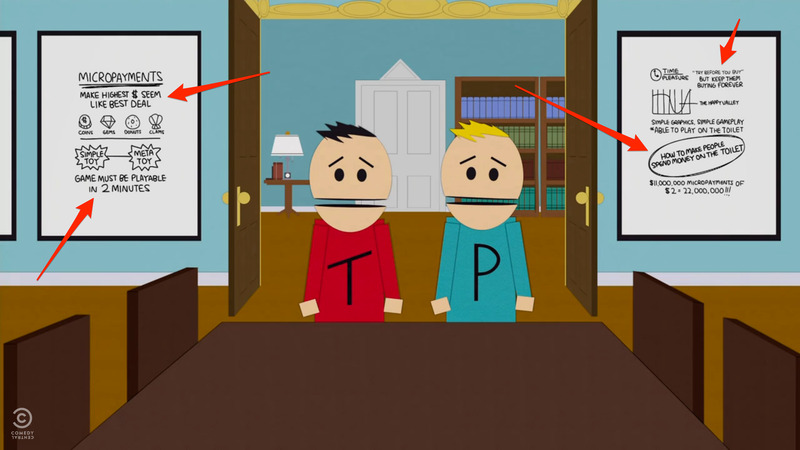 Comedy Central/South ParkWe are, aren’t we? No, wait. I didn’t even try that hard! 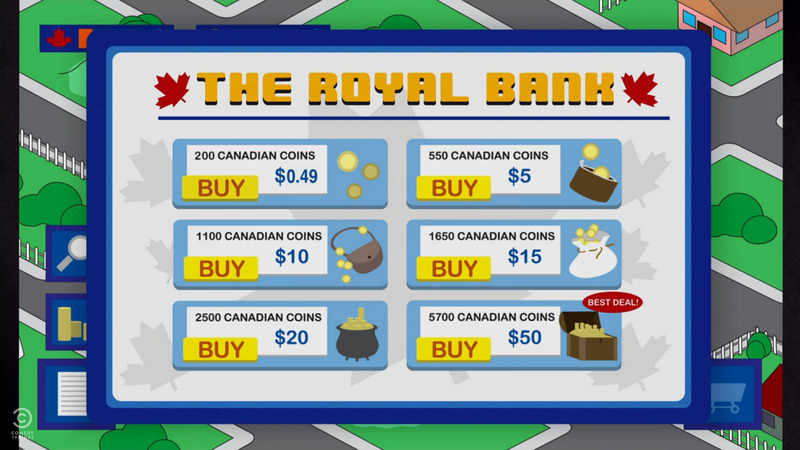 But before he can continue, Kyle’s given an offer to purchase “Canadough Coins” to buy stuff in the game. A screen pops up prompting Kyle to buy something similar to any regular mobile-based free game app. 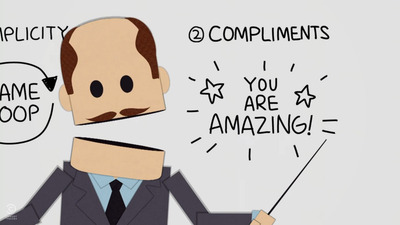 Comedy Central/South ParkWhat is this? I just want to get back to the game. 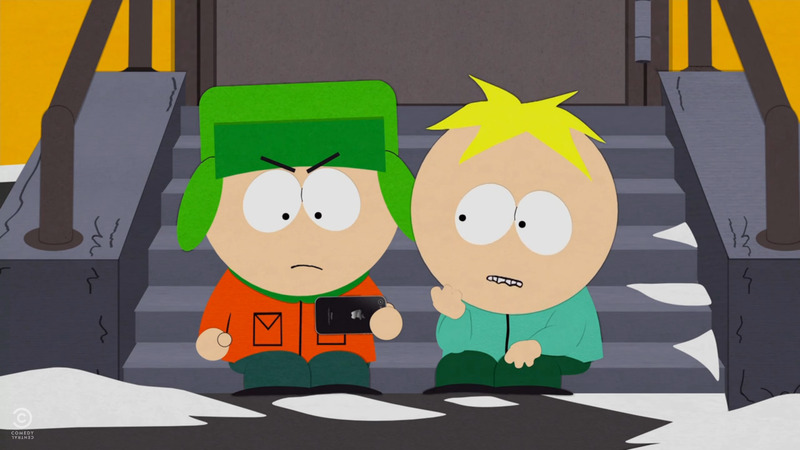 Kyle immediately thinks it’s “stupid”; however, his friend Butters points out it only costs $US0.49 to purchase the smallest amount of Canadough coins. What could it hurt? His small purchase lets him click on a piece of land to buy and place a hospital. 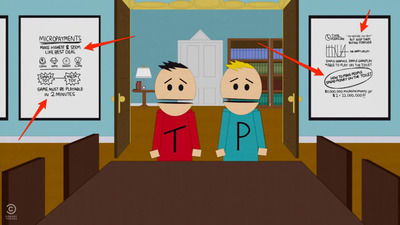 I’m glad Terrance and Phillip look happy, but, that’s it?! Kyle soon realises the game isn’t all it’s cracked up to be and wonders what kind of people are behind the game. 1. Simplicity: A player must be enticed with a simple game loop. 2. 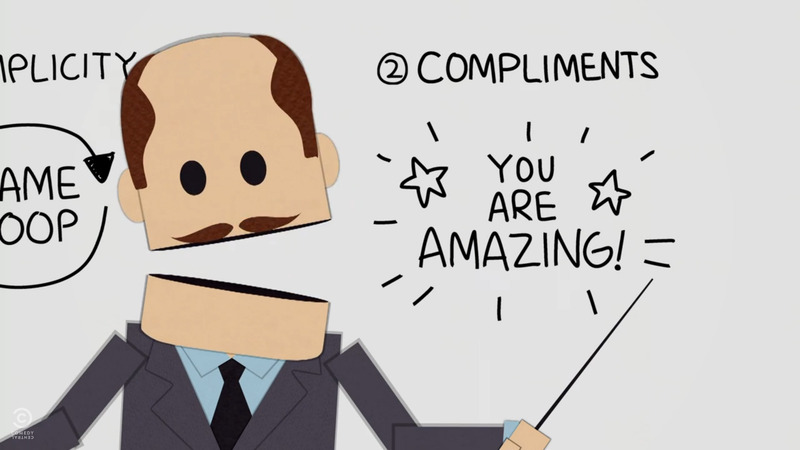 Compliments: Make sure you’re making the gamer feel special and good about themselves. 3. Fake Currency: Train the players to spend your fake currency. 4. Switcheroo: Offer the customers a way to spend their real money for fake, virtual dollars, so they will forget they’re spending money. “South Park” added a few other funny tips for the success of freemium games in the background. Comedy Central/South ParkIf you can’t play a mobile game in under two minutes and can’t get people to play in the bathroom, then it’s probably not a solid game. 1. Find the heaviest users (addicts). 2. Extract the most amount of cash from them. 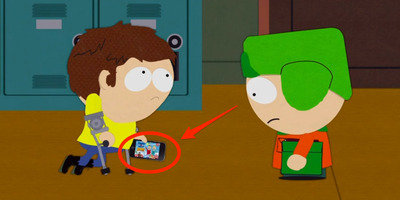 This is what happens in “South Park” when one of the kids, Stan, can’t stop playing the “Terrence & Phillip” mobile game. He skips school to play the game for hours on end and winds up spending upwards of $US26,000 (a rather exorbitant amount), justifiably freaking out his parents. 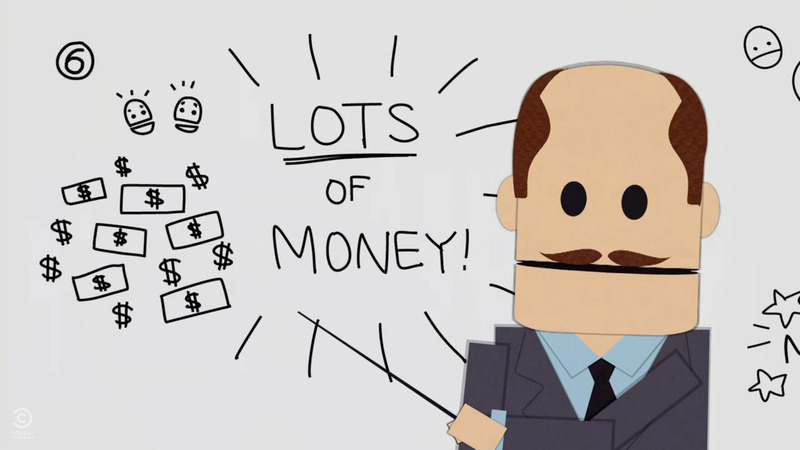 Comedy Central/South ParkYou should not be spending more money on a mobile game than a console game. “South Park” likens this new mobile gaming addiction to other diseases like gambling and drinking. And this is why I will not play mobile games. 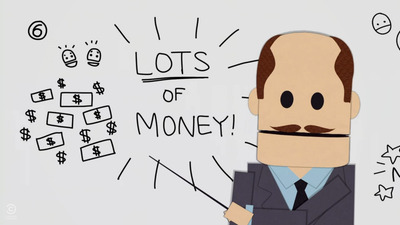 I think I’ve paid small fees twice in “freemium” games. The first time was in a “Despicable Me” temple run game (I will admit, that was totally worth it). The other time was while testing out the Kim Kardashian app (had to get that A-list celeb status). That was two times too much. 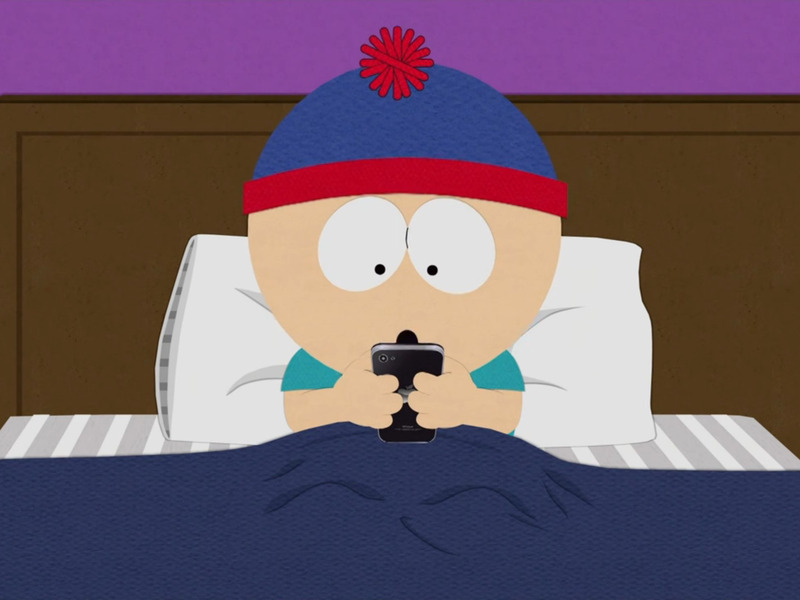 You can watch the full episode of “South Park” on Hulu.